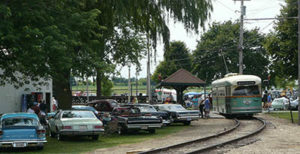 On August 4th, 2019, the 29th Annual Vintage Transport Extravaganza will be held at the Illinois Railway Museum. The event brings together the “other” popular modes of transportation – cars, trucks, buses and more – on the campus of the nation’s largest operating railway museum. It is one of the largest antique vehicle shows in the entire state of Illinois and among the most popular events at the museum. In addition to some 500 antique vehicles that will be on display, the museum will be operating a variety of special equipment the day of the event. Frisco 2-10-0 1630 will be in operation, as will the “Nebraska Zephyr” and historic electric trains from the North Shore Line and Chicago Transit Authority. Streetcars including 1906 “Matchbox” 1374, “Green Hornet” 4391, and an open car from Veracruz, Mexico will carry passengers on the streetcar line. Antique cars from Model T Fords all the way up to 1990s sports cars will be on display alongside historic motor buses, trucks, electric trolley buses, and military and other vehicles. The show is open to all vehicles 1997 and older. For more information on attending or bringing a vehicle to the event, call the museum office at 815-923-4391 or download the PDF of the registration form (coming soon). For hours, admission prices, and scheduled operating equipment click here.All schedules and equipment subject to change without notice.